Fundraising is all about maximizing the money coming in and minimizing the money going out. Talkingink custom t-shirts can help with our free online stores. You’ll be ahead of the game before you even get started. Interesting Fact: Research has shown people tend to give more, and more people tend to give to a cause when they receive a tangible item in return for their donation. A custom t-shirt is that perfect tangible item and it works twofold. You are giving your donor a low cost tangible item while at the same time giving them a shirt they will wear which will only advertise your fundraiser. It’s a win win for everyone! 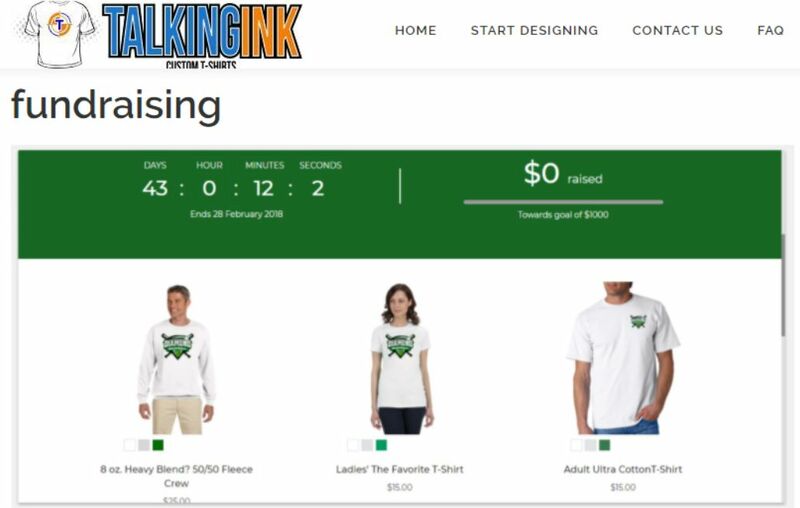 With the percentage of people buying online a custom fundraising store makes perfect sense to sell your custom t-shirts. A t-shirt fundraiser is a popular way to go and doing so online takes all of the hassle out of the experience for you. Talkingink provides 100% free online fundraising stores to people. In fact as the fundraiser organizer you never pay us anything. We collect our money from the donors each time a shirt is sold. You collect your money on the profit, or the price difference between our cost and your resale price. It’s that simple. As a t-shirt fundraiser organizer, you have 3 duties. 2. Choose which product or products you want to sell. 3. Promote the online fundraiser store to your donnors. 1. Produced an online fundraising store to offset the cost for kids going to an out of town tournament. 2. A sports team does a store a few times per year to offest the coasts of other apparel they order. There is really no fundraiser where selling custom t-shirts wouldn’t fit. Here is a link to our online fundraising store page. It’s filled with information and a demo store. Talkingink is always a phone call or email away to answer any questions.